These companies may not be household names, but they make many products you use every day. That insulates them from volatility and bodes well for long-term investors. Although the words seem to be used interchangeably today, there's a difference between trading and investing -- a big difference. The former implies that you're trying to time the market in search of quick returns. It requires a lot of time and can go off the rails easily (and suddenly). The latter implies that you're committed for the long haul and won't fret over every little movement that the stocks you own make. You may not even check your portfolio that often, aside from making your initial investments and accumulating shares in great companies at great prices. If investing -- real investing -- sounds more appealing to you, and you hate checking your portfolio on a daily or even weekly basis, then you may want to consider Goodyear Tire & Rubber (NASDAQ:GT), Weyerhaeuser (NYSE:WY), and International Paper (NYSE:IP). OK, so most people have probably heard of Goodyear Tire & Rubber, but only thanks to a clever and long-standing marketing ploy involving inflatable airships. Though it's over a century old, the company is still a leader in its industry, boasting 49 manufacturing facilities in 22 countries, generating over $16.4 billion in sales in 2015, and steadily improving the profitability of operations in recent years. Management's strong focus on strengthening its balance sheet has led to a walloping of the S&P 500 in the last five years. Investors are betting that the company's turnaround is far from over. While total revenue has fallen every year since 2011, and is on pace to fall again this year, the business is healthier and more profitable now than at any time in recent memory. In fact, Goodyear Tire & Rubber recently announced its capital allocation plans for the period of 2017 to 2020. It allows for up to $1.9 billion in growth investments, up to $900 million in debt repayments (representing 16.5% of total long-term debt on the balance sheet now), up to $800 million in restructuring payments (to reduce costs and improve operating efficiency), and up to $3.5 billion in share repurchases and dividend payments. The latter depends on operational performance, but it won't go unnoticed that in late 2013 the company started paying a quarterly dividend to investors for the first time in its history. Although modest, the dividend has more than doubled since. 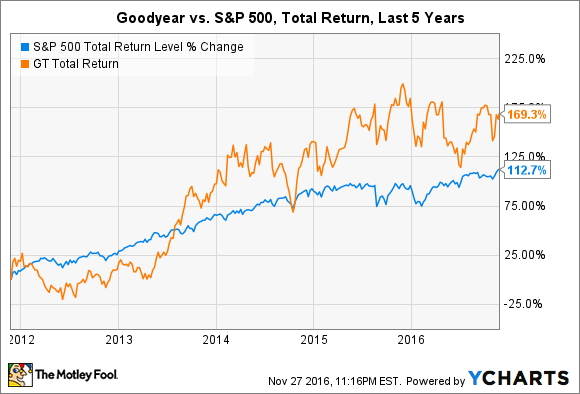 Given the company's opportunity for significant improvements by the close of the decade and intentions to directly return value to shareholders, you certainly wouldn't need to babysit an investment in Goodyear Tire & Rubber. 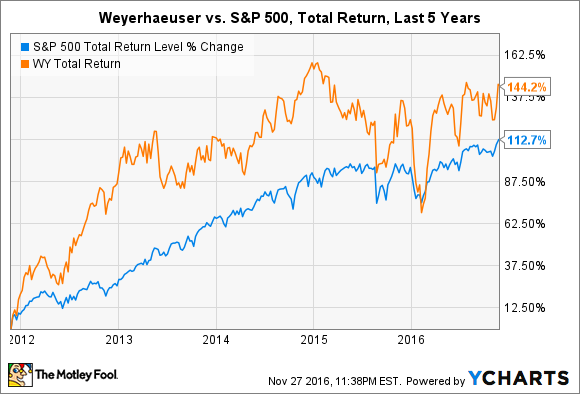 Weyerhaeuser stock may not be anywhere near all-time highs, but its market cap is on a tear. The company is primarily involved in timber operations and wood products (if you've ever purchased plywood, then you may have seen its logo printed on the stack). A massive merger with Plum Creek Timber Company in early 2016 increased the number of shares outstanding by nearly 50%, although Mr. Market didn't punish the company for long. The merger was a signal that management is doubling down on timberlands and wood products, which can generate more reliable profits than other businesses spawned from forest management and which have great growth prospects. So far, so good. Through the first nine months of 2016, EPS from continuing operations of the merged company stood at $0.58, up 21% from the same period of 2015. The merger also catalyzed an impressive string of asset divestitures, namely businesses deemed to reside outside the core focus on timber products, such as pulp and paper. Since May 2016 Weyerhaeuser has padded its balance sheet and streamlined operations by selling over $2.5 billion in assets -- with more on the table. That should allow the dividend, currently yielding 3.9%, to continue growing for the foreseeable future. The largest single asset sale from Weyerhaeuser was the $2.2 billion unloading of its pulp business. The buyer was International Paper -- and it paid in cash. The pulp and paper industry is about as smelly and boring as it gets. (I would know; my undergrad major was spun off a degree program in paper engineering.) But boring can be great for long-term investing. That's especially true given the diversity of the company's businesses into fairly stable markets, such as industrial packaging and consumer packaging, which allows it to take part in all-cash transactions in the billions and pay shareholders a 3.8% dividend yield. It's not a glamorous business, but your paper coffee cups and food packaging have to come from somewhere. 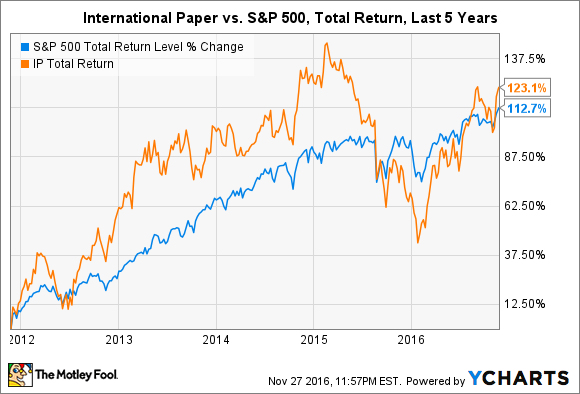 That somewhere is highly likely to be International Paper, which has operations throughout the world, although the overwhelming majority of its $22.3 billion in sales last year were generated in the United States. It keeps costs low by recycling fiber from used paper products, recovering and reusing 97% of pulping chemicals, and using biomass for over 70% of its energy needs. That results in consistently healthy cash-flow positive operations in an industry known for low margins and red ink. There's really no need to watch over your investment portfolio if you're confident in the businesses you own. That's not to say unexpected headwinds won't crop up, but the day-to-day check-ins are usually unnecessary in the grand scheme of things. So, if you hate checking your portfolio, you may want to take a deeper look into the strong businesses operated by Goodyear Tire & Rubber, Weyerhaeuser, and International Paper.